At Trinity, our goal is always to deliver high quality and cutting-edge mixed-use urban projects, regardless of the challenges stemming from politics, infrastructure, environment or market profile. 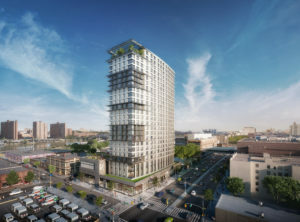 So when we responded to the City of New York’s Request for Proposals for 425 Grand Concourse in the Bronx, which sought a mixed-use building with 100 percent subsidized affordable rental units, it was time to get creative and include as many community benefits as feasible. Currently, 425 Grand Concourse is in the midst of a major revitalization. Under the ownership of the City of New York, the parcel is intended to support the creation of long-term affordable housing in a quickly gentrifying neighborhood. We put together a plan to help bring the building, and the substantial changes requested by the City, to fruition. Savings. In affordable housing, since rents are comparably lower than market-rate apartments, a tenant’s utility bill takes up a much larger share of the family’s housing cost than it would for market-rate housing. With a total energy demand of only 25 percent compared to a code-compliant “standard” building, the savings on utility costs have major cost savings for both tenants and landlords. Maximizing heat- and energy-recovery systems. A “standard” new building includes a thermal building envelope and stale air exhaust system, typically via a toilet and kitchen exhaust. Passive House works by combining increased thermal and air tightness performance of the building envelope and heat- or energy-recovery. With energy-recovery systems, 80 to 90 percent of the energy contained in the exhaust air is recovered and used for the pre-conditioning of the incoming fresh air, greatly reducing the actual heating and cooling loads. Fresh air supply. The mechanical fresh air supply through heat- or energy-recovery units into apartments has additional benefits to tenants, including significantly increased comfort from a constant, tempered, low-velocity fresh air supply with filtered, fresh outside air. For tenants, this means minimal exposure to asthma triggering dust and other environmental particles commonly found in outside air. Building quality. With increased thermal and air barrier requirements for the facade, foundations, and roof, quality control during design and construction is critical to achieving the Passive House standard. The result? A better performing building envelope as well as mechanical system that keep pests, air pollutants, water, and noise outside the building. But still, teams considering Passive House need to look at the challenges of implementation. Typically, the consequent continuity of the exterior air barrier and the superior thermal envelope with minimized thermal bridging are challenges of any Passive House, and new techniques for air sealing and the elimination of thermal bridges need to be learned, developed and applied. Specialty consultants for Passive House certification and air tightness testing are necessary in addition to standard consultants, but both standard consultants and the development and construction team also have to undergo Passive House training. Without the entire project team committed, Passive House certification will be hard to achieve. With all these obstacles, why would a developer voluntarily choose to achieve the Passive House standard in a multi-family building? Passive House benefits are easier to achieve in multi-family than in single family buildings as the ratio between envelope size and enclosed building volume is much more favorable in multi-family projects. The main source of added cost to construction of a Passive House is the energy-recovery ventilation, as well as the added design and construction work to ensure a continuous thermal and air barrier. But with HVAC systems much smaller than in standard buildings, it can be argued that the increase in construction cost is minor. When you look at the benefit of reduced utility bills, increased tenant comfort and building quality, the advantages are undeniable. Public policy is also boosting the push for Passive House. The City of New York is among one of the first major American cities to have pledged to reduce carbon emissions by 80 percent of the 2005 levels by 2050, in order to stem the effects of human-induced climate change. In New York, the vast majority of carbon emissions stem from buildings, so Passive House is an important building concept monitored by City Hall with great interest. As the benefits of Passive House continue to grow more apparent, we’re excited to see how it becomes integrated into multi-family buildings across the rest of the United States. With our experience at the forefront of the Passive House movement as one of the first developers in the country to implement the Passive House standard in a multi-family building, we look forward to being involved in additional Passive House implementation in the future.